An entrance test like GATE demands extensive knowledge and revision of the concepts covered under the GATE 2018 curriculum. GATE tests the in-depth knowledge and practical knowledge of varied concepts. We at Arihant understand the importance of previous years' solved papers in mastering the concepts covered the GATE Chemistry curriculum. The present book contains last 18 years' (2000-2017) solved papers of GATE Chemistry. 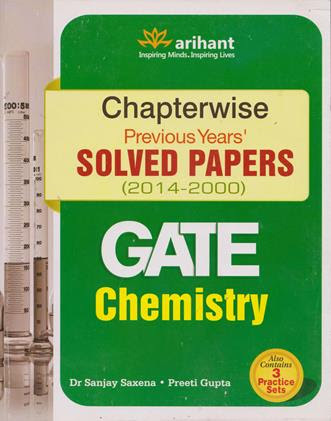 To familiarize the aspirants with the current trends of questions asked in the GATE Chemistry Examination, the book contains last six years' (2012-2017) Solved Papers. A brief description about the syllabus as well as Recent Changes in GATE have given in the beginning of each chapter which will help the students to know what topics the chapter covers. The book has been divided into 10chapters namely Atomic Structure, Chemical Bonding and Molecular Structure, s-Block and p-Block Elements, Transition Elements, Chemical and Ionic Equilibrium, Electrochemistry, Chemical Kinetics, Chemical Thermodynamics, Basics of Organic Reaction Mechanism and General Aptitude. The previous year questions divided into 1 Mark and 2 Marks Questions have been given chapterwise and yearwise with detailed solutions at the end of every chapter. The book also contains three Mock Tests that will help the candidates to analyze the level of preparation for the upcoming GATE Chemistry examination 2018.With ample number of previous years' solved questions, this book will help aspirants score high in the upcoming GATE Chemistry Examination 2018.